Another great brief from the Defence Force team at GPY&R Melb. This was technically a very difficult job to realise as we had to start off with a basic model of the helicopter, then deconstruct it & literally invent structures that could be placed inside the interior. To achieve the concept of a technical drawing, many parts were required to be interspersed in rows that could potentially join up to form a whole part of the helicopter. We had reasonably detailed information about the helicopter's engine & cockpit, but more obscure details like the internal airframe & hydraulics had to be designed more or less as we imagined them and then made to look as authentic as possible. The most difficult part of the job was to determine just how realistic the scene should be. Was it a large aircraft hangar where a real helicopter had been pulled apart and then suspended along with it's pilots in the air? Or should we be exploring a combination between a technical illustration & model? The end result became a hybrid of both of these ideas, hovering somewhere between a technical illustration & a photo real image. 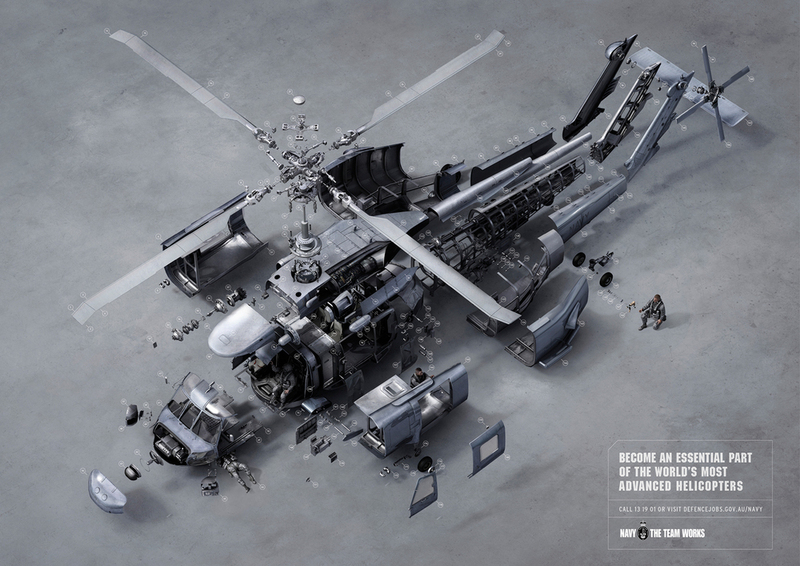 This aesthetically beautiful, yet very technical 3D visual went on to win a well deserved bronze press Lion at Cannes for art direction. We were so happy with the final image that we decided to create an animation version. Another great brief from the Defence Force team at GPY&R Melb. This was technically a very difficult job to realise as we had to start off with a basic model of the helicopter, then deconstruct it & literally invent structures that could be placed inside the interior. To achieve the concept of a technical drawing, many parts were required to be interspersed in rows that could potentially join up to form a whole part of the helicopter. We had reasonably detailed information about the helicopter's engine & cockpit, but more obscure details like the internal airframe & hydraulics had to be designed more or less as we imagined them and then made to look as authentic as possible. The most difficult part of the job was to determine just how realistic the scene should be. Was it a large aircraft hangar where a real helicopter had been pulled apart and then suspended along with it's pilots in the air? Or should we be exploring a combination between a technical illustration & model? The end result became a hybrid of both of these ideas, hovering somewhere between a technical illustration & a photo real image. We were also approached by the agency to provide an animated version. This aesthetically beautiful, yet very technical CGI visual went on to win a well deserved bronze press Lion at Cannes for Art Direction. It was also selected to appear in Luerzers Archive 200 Best Digital Artists Worldwide 2013-2014.